ENL holds that value and cost pertain to humankind alone. It follows that natural cost does not refer to environmental damage itself, but instead to the human health effects associated with such damage. It is thus an indirect rather than a direct effect of production. Environmental degradation is obviously addressed in ENL, but this is done by treating the environment as a constraint, not as a cost. Constraints are addressed through environmental limits. This dual approach to the environment reflects the two key dimensions of the ecological problem. The first dimension consists of short-term environmental effects such as pollution and noise that predominantly affect human beings who are currently alive. The second is the longer-term threat of ecological decline and collapse that could devastate future human beings. This section addresses those now living. Unlike the unborn, their health can be measured, and the concepts of value and cost can therefore be applied to them. Natural cost, like labor cost, can initially be positive or negative, and tends to increase at the margin. It is positive when production degrades the environment such that health is adversely affected. It is negative when a cleaner or more habitable environment is created, resulting in increased health. 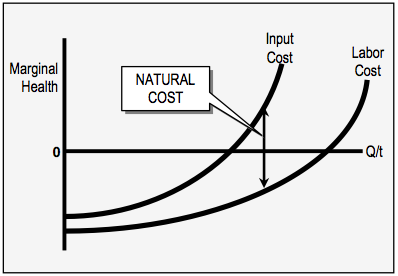 Because input cost is the sum of labor cost and natural cost, natural cost is graphically depicted as the difference between the input cost curve and the labor cost curve. See the figure below. This is the indirect damage to human beings from the effects of production on the environment. It is depicted graphically as the vertical distance between the labor cost curve and the input cost curve. Natural cost tends to increase at the margin because wastes typically accumulate in the environment, as does the impact of habitat destruction on non-human species. This will cause an escalating effect on humankind, which is depicted by the growing space between the two curves. There are two reasons for representing labor cost as the bottom curve and natural cost as the difference between the two curves. First, labor cost is the direct effect of production, whereas natural cost is the indirect effect. It seems more appropriate to explicitly depict the direct factor. Second, natural cost is more likely to be positive across the entire range of an output’s quantity, thus preventing the two curves from crossing, and keeping such graphs relatively uncluttered. It is important to understand that, even if the analyst has chosen regional geographical scope, the natural cost of local production is always considered on a global basis. When greenhouse gases escape from a region, or when agricultural phosphates invade an international waterway, the worldwide health impacts of these environmental effects are counted as a natural cost for the region that initiated the damage. In this sense there are no environmental "externalities" in ENL — while external physical effects are possible when regional scope is employed, their health consequences are always included in the originating region's economic calculus. In dealing with pollution, particular attention must be paid to the vulnerable members of a population, who are affected much more severely by environmental toxicity than its healthy members. This difference in vulnerabilities within a population is an important aspect of the maldistribution of wastes. 1. "Texas study finds link between pollution, cancer," Scientific American website, January 19, 2007 (story from Reuters). 2. "Black Soot and Asthma," New York Times website, November 19, 2006. 3. Jeremy Laurance, "Chemical Pollution 'Harms Children's Brains'," The Independent, November 8, 2006. The same article quotes environmental epidemiologist Robert D. Morris: "What we're seeing is that there is essentially no threshold when we look at susceptible populations…"